I just want it to be happy once and for all. If anyone lives in the Philadelphia area and is looking for a pigeon to befriend, then please help the both of us. Hi kyou and welcome to our forum. I'm sure glad you went back and got your bird because it's extremely unlikely he would survive in the wild now. You see, pigeon parents teach their babies survival skills such as where to roost, what to fear and what to eat and where to find it. Without that benefit, odds of survival are very limited. I do know of a person in Philadelphia looking for a companion for his female pigeon. I'm happy to email him this link and see if he's interested. Do you think your pigeon is a male? 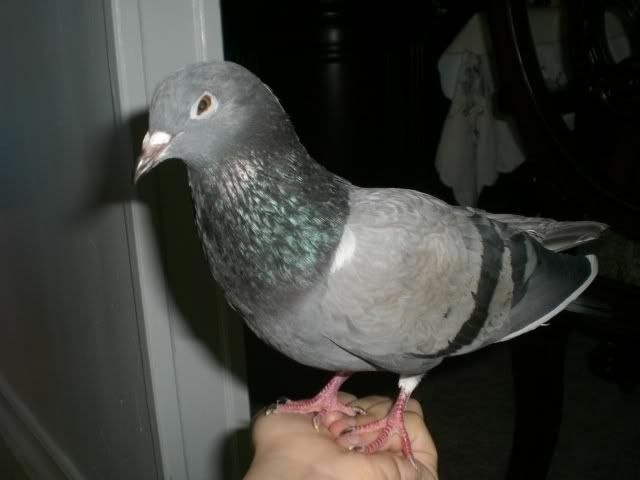 Hello & welcome You have a very beautiful pigeon, I'm so glad that you have been caring for him/her. I hope that Charis has luck in finding a wonderful home for your pij. It looks like you've done a wonderful job of raising your little rescue. He's stunning. I hope you are able to find the perfect home for him. That's probably why when I took it back to the city, it mostly stood there (a little walking but not flying once) even though there were other (wild) pigeons around it. I too am glad that it is back but every single day it makes me sad to put the poor guy in the cage and watch it spin and make what I call 'depressed' sounds. But I also want it to be safe so that's why I don't know what to do. I never had a pigeon in my life before and it's truly a wonderful feeling to be able to hold one. But again, I want this bird feeling happy. I mean is it going to be allright? Do you think it happened when it fell from it's nest? You see...since you raised this pigeon...it's not feral at all. In fact...he probably has no idea at all he's a pigeon. The sound he is making aren't distress sounds...he's making mating sounds for you. 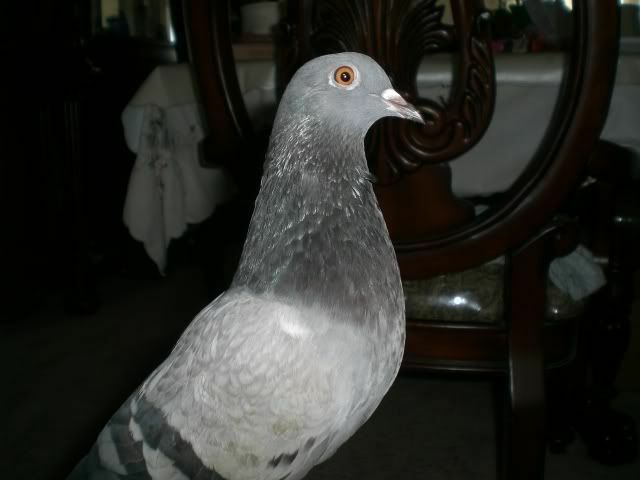 Many people have single pigeons as companions and they do great. Pigeons mate for life and so with pigeons that are human identified, they choose a human as their mate. You and the life your pigeon has come to know, is the only one he can identify with. The life outside would be very frightening. What do you mean about the eye? I meant both of it's eyes aren't the same...These pictures show both sides and the second one is much different looking. I was wondering if it still can see with that eye. By the description you give about him making 'distress' sounds, I would venture to guess you have a male. Males will usually 'coo' frequently, while bowing their heads, circling and sometimes fanning their tail trying to get the attention of a sweet little female. Very normal behavior. If you haven't come across it yet, click here to read about Toto, who lives the Life of Riley with his human mate, Naomi, and loves every minute of it. As far as his eye, does he seem to be able to see out of it OK? It looks to me like he may have lost the sight in the one eye. Has it always been like that? I noticed the left eye in the picture. Does he seem to see your hand if you come up to him on that side? Hold a treat or something in your hand, then start from behind him and bring it to the front of him on that side. See if he notices it before it is actually in front of him. He's a cute little guy. Do you give him a lot of time outside of the cage? Just yesterday, I found an egg in the cage! It's so beautiful looking too Could this be why it was trying to hide it's head inside the the seed container? I actually did try to put the treat on side, but it looks like it sometimes does pay attention but sometimes not. I just want my love feeling good. Rae Charles does the same thing. I thought for the longest time she was a male. Only to be corrected one morning when I found an egg in her cage. It really sounds to me like she's quite content. In a couple of days she will lay another egg. Do let her lay on them until she doesn't want to any longer. Her body will know when to abandon them. The reason I tell you this is because now that she has started the egg laying process, she will continue and the process does deplete the body of calcium and so the rest of incubating is good. Do give her calcium with vitamin D, which is needed to process the calcium. Without enough of either, she may develop problems that can be fatal. Realizing every situation is different, with Rae Charles, she might lay an egg (1) every 6 months or so. Sometimes it's longer. Wouldn't it be wonderful if they all layed that often? I, for one, would be tickled pink. I for 2, would be tickled pink right along beside you. Alrighty then, we have two tickled pinks. Do I hear three, four or five tickled pinks? I think most people with pigeons, who are not trying to breed, will agree. I have a paair who it is very hard to switch out the eggs on. Sammy and Gully. She always seems to catch on. Even if I switch them when he is on the nest. It's not easy getting the fake eggs by her. I really hate it, because she will then have more eggs to replace the two I took. Having so many is not good for her. It would almost be easier just to let her hatch them. At least she would be setting on eggs for the required time and not having more. Sometimes these birds are too darn smart. I think most people with pigeons, who are not trying to breed, will agree. I have a paair who it is very hard to switch out the eggs on. Sammy and Gully. She always seems to catch on. Even if I switch them when he is on the nest. It's not easy getting the fake eggs by her. I really hate it, because she will then have more eggs to replace the two I took. Having so many is not good for her. It would almost be easier just to let her hatch them. At least she would be setting on eggs for the required time and not having more. Sometimes these birds are too darn smart.